If you don’t know that Valentine’s Day is right around the corner, you must be living under a rock. Every shop, TV channel or Radio Station advertises it. Even Anti-Valentine’s Day products are being advertised. And if you thought you were getting away from it here, you are, unfortunately, wrong. I have to clear up though that I am not a massive fan of Valentine’s Day. Firstly because I think it puts a lot of pressure on people (single and attached) to buy ridiculously expensive flowers and gifts and if you DON’T have a ‘Valentine’, you feel like a loser. I know you say you don’t, but I’ve been there, and I did. As a high school girl the entire February would revolve around who’s got the hottest Valentine and who’s going to get a boy to give them flowers at school (keep in mind I was in a girls only school, with our ‘brother’ school across the street from us) . And, let’s just say, I ‘peaked’ early and I was a lot taller and a lot more, um, ‘voluptuous’ than the other girls in my grade (to put it bluntly, I started wearing a bra at 11). And as High school boys were generally much more immature and short than I was, I opted to go for the Varsity boys, which were all too glad to take a 16 year old who looked like a 20 year old ‘under their wing’. But sadly, that also meant that I almost NEVER had a Valentine because Varsity guys are ‘too cool’ for that, you see? Another reason why I’m not too fond of Valentine’s day, even now that I’m married, is that I get loved everyday, maybe not the same amount everyday, but never-the-less, I get loved. So I don’t really get why I should become all ‘coochie-dee-coo’ and plaster a big red ribbon around it for one day. And even if I loved the idea of it, my husband doesn’t, so I wouldn’t be getting flowers anyway (unless I sent them to myself). 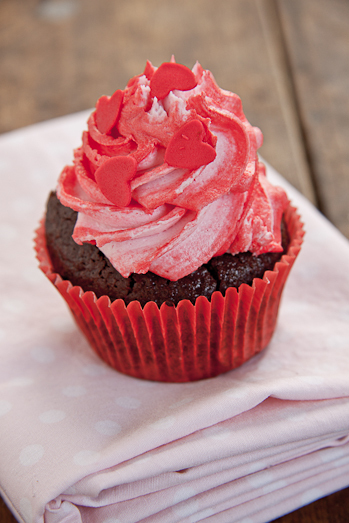 And even though I won’t spend lots of money for one day’s worth of ‘love’, I can still bake cupcakes and decorate them to the point of no return. A friend commented that these looked like “Valentine’s Day had hurled all over it”. No surprise that she also hates the day, huh? I’ve been playing around with Fondant (plastic icing) for quite some time now and I really enjoy making roses. It’s almost therapeutic and relaxing to work with your hands and make something so beautiful so I decided to make a few for these cupcakes. I’ll be posting a ‘step-by-step’ how to tomorrow so you can also make these for your beloved. I also made some plainer, but no-less impressive, cupcakes for those of you who don’t feel you’re quite ready for ‘rose sculpting’ just yet. And let me just say, even though I don’t expect anything on Valentine’s Day, my heart would skip a beat if my husband presented me with a platter of these beauties. Chocolate, roses & strawberries, all in one! Pre-heat the oven to 180°c. Line a muffin-tray with cupcake cases. Combine all the dry ingredients together and mix well. In a separate bowl, whisk together the egg, milk, melted butter and vanilla. Pour the wet ingredients into the dry ingredients and beat for 2 minutes until well combined. Slowly add the hot water and mix through. The batter will be very runny, so don't be alarmed. Pour the batter into the cupcake cases (I fill mine about 3/4 full) and place into the oven. Bake the cupcakes for 15-18 minutes until a skewer inserted comes out clean. Remove from the oven and allow to cool for 5 minutes in the tray. Remove them from the tray and allow them to cool completely on a wire rack. Beat the butter until pale and fluffy. Sift in the icing sugar and beat until the mixture comes together in a ball. Add the milk, flavouring and colour and beat for another minute. 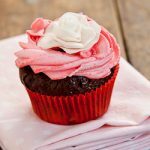 To create the 'ripple' effect, streak the inside of the piping bag with some red/pink gel food colouring (I just use a toothpick and draw lines on the inside of the bag). Fill with the buttercream and pipe onto the cooled cupcakes. These cupcakes are so pretty,I’m delighted with them so I’ve featured this recipe on my blog, hoping that you don’t mind, but if you do, please contact me and I’ll remove it. All the best. Hi , I tried to make cupcakes from your recipe 2 times and I always got some kind of sticky undercooked “cupcakes” and they tasted like salted batter . I believe I had followed the exact directions from your recipe but still can’t make it right =( . 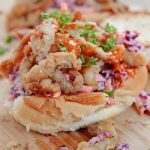 PLEASE HELP ME , I really like your recipe but I just can’t figure out what’s the problem here =( !!! Sara, the only thing I can think is that you’re perhaps not using unsalted butter? If you are using normal butter, then rather omit the 2.5ml salt. This is the only way I make Chocolate cupcakes so I can’t think of a reason why they would be undercooked unless you don’t bake them for long enough. Perhaps our ovens have very different temperatures and you should maybe bake your cupcakes for longer? If you still have problems, please let me know. HI Great recipie for cup cakes I made them but managed to make icing pink!! still looked and tasted good. Hubs ate 4 at one sitting!! The cupcakes are gorgeous! 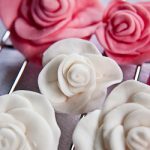 have you tried chocolate paste to make the roses? It is really easy to work with and the paste can be coloured to your preference. in my opinion it also taste a lot better than fondant, not quite so sickly sweet. I have a great recipe for the chocolate paste. Julie, I’ve never worked with Chocolate Paste before. I’m only now venturing into ‘sculpting’ and I very rarely decorate cakes with fondant. But thanx for the idea, I’ll look into it. Those are beautiful!!!! 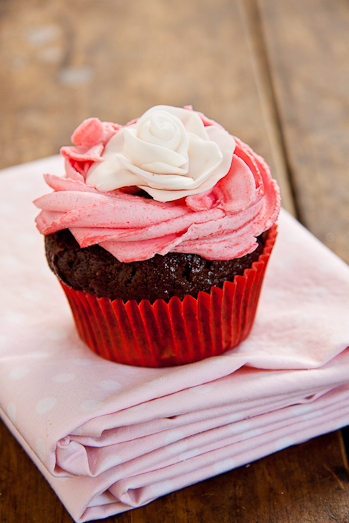 I would call that a perfect cupcake! COME ON!!!! I just showed my husband what i want for Valentines at it was your cup cakes!! They look AWESOME!! Ally – if you put those in a beautiful brightly coloured hat box lined with tissue paper and wrapped with fabric ribbon and fresh roses, you would make a KILLING!! Oh my word, they are just to beautiful to eat!!! Mandy : lol The only problem is, people don’t like paying a lot of money for cupcakes, they think they should be cheap because they are at supermarkets! 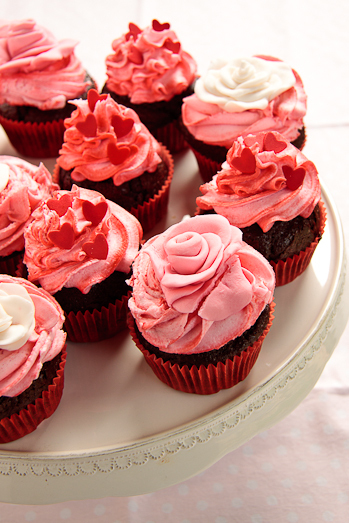 You really have shown the love with those beautiful cup cakes.